Download a selection of the presentations and posters below via Research Gate profile. Katherina Audley, Arturo Mellín, Andrea Jacqueline García Chávez, Abel Organiz, Avimael Cadena, Terra Hanks, Claudia Auladell Quintana, Raúl Ramírez. Cuando las ballenas ganan, todos ganan: Implementación de investigación participativa para una cultura de administración ambiental en Guerrero, México. Conference: XXXVI Reunión Internacional para el estudio de los Mamíferos Marinos. May 2018. Raul Ramirez Barragan, John Calambokidis, Elana Dobson, Jason Holmberg, Hendrik Weideman, Drew Blount, Ted Cheeseman, Andrea Garcia Chavez, Terra Hanks, Andrea Garcia Chavez, Arturo Mellin, Abel Organiz, Katherina Audley. Tendencias, vínculos migratorios y uso de hábitat de la ballena jorobada Megaptera novaeangliae (Borowski, 1781) en Guerrero, México. Conference: XXXVI Reunión Internacional para el estudio de los Mamíferos Marinos. May 2018. García Chávez, A., Hanks, T., Calambokidis, J., Dobson, E., Audley, K.Monitoreo de mamiferos marinos en el estado de Guerrero, México. Conference: XXXVI Reunión Internacional para el estudio de los Mamíferos Marinos. May 2018. Ramos, E.A., Castelblanco-Martínez, N., Garcia, J., Rojas-Arias, J., Foley, J., Audley, K., Van Waerebeek, K., Van Bressem, M. Lobomycosis-like disease in bottlenose dolphins in Belize and Mexico: Bridging the gap between the Americas. Diseases of Aquatic Organisms. March 2018. DOI: 10.3354/dao03206. Eric Angel Ramos, Nataly Castelblanco-Martínez, Iain Kerr, Andy Rogan, Katherina Audley, Marcelo O. Magnasco, Diana Reiss. Behavioral Reactions of Marine Mammals to Drones. Conference: 22nd Biennial Conference on the Biology of Marine Mammals. October 2017. See poster. García Chávez, A., Hanks, T., Calambokidis, J., Dobson, E., Audley, K. Marine Mammal Monitoring in the Southwest Pacific State of Guerrero, Mexico. Conference: 22nd Biennial Conference on the Biology of Marine Mammals. October 2017. Steiger, Gretchen H., Calambokidis, John, Wade, Paul, Audley, Katherina, Baker, C. Scott. Migratory destinations of humpback whales that feed off the US West Coast: Implications for management under the newly recognized Distinct Populations Units Relevant References. Conference: 22nd Biennial Conference on the Biology of Marine Mammals. October 2017. See poster. Audley, K., et al. Cataloging Data of Entangled Humpback Whales in Northeast Pacific Wintering Areas 2014-2016. NOAA Report. December 2016. Audley, K. Cultivating an ethos of marine stewardship through citizen science and educational outreach in the municipalities of Petatlan and Zihuatanejo, Guerrero. Presented at Society for Mexican Marine Mammalogy Conference, La Paz, Baja California Sur, May 2016. Dobson, E., J. Calambokidis, A. Kaulfuss, J. de Weerdt , V. Pouey-Santalou, A. Garcia Chavez, K.Audley. 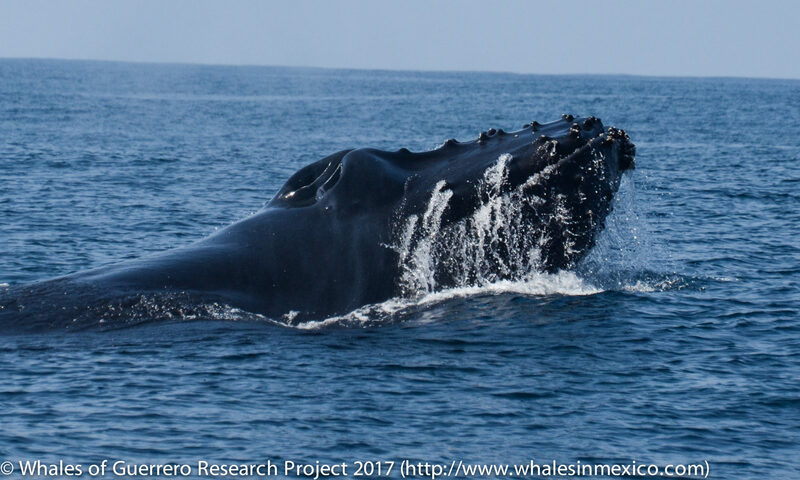 Migratory destinations of humpbacks from Guerrero in Southwest Mexico reveal extension of Central American breeding grounds. Presented at Society for Marine Mammalogy Biennial Conference. San Francisco, California. December 2015. García Chávez, A.J., et al. Marine Mammal Monitoring in the Southwest Pacific State of Guerrero, Mexico. Presented at Society for Marine Mammalogy Biennial Conference. Halifax, Nova Scotia. October 2017. See poster. Garcia Chavez, A. J., T. Hanks, A. Mellín, , C. Auladell Quintana,C., P. Chevallard Navarro, V. Pouey-Santalou, V., J. de Weerdt, A. Kaulfuss, M.Smultea, K.Audley. First systematic humpback whale studies in the vulnerable state of Guerrero, southwest Mexico. Presented at Society for Mexican Marine Mammalogy Conference, La Paz, Baja California Sur, May 2016. IWC. 2017. Progress Report on Cetacean Research in Mexico for the Calendar Year 2016. Paper Romania presented to the IWC Scientific Committee, May 2017(unpublished). Meléndez Herrada, A, et al. Biodiversidad de Barra de Potosí, Guerrero, México. Universidad Autónoma Metropolitana. Num. 123. Serie Académicos. 2015. National Marine Fisheries Service (NMFS), National Oceanic and Atmospheric Administration (NOAA), Commerce. Endangered and Threatened Species; Identification of 14 Distinct Population Segments of the Humpback Whale (Megapteranovaeangliae) and Revision of Species-Wide Listing. Federal Register. September 8, 2016. National Marine Fisheries Service (NMFS), National Oceanic and Atmospheric Administration (NOAA). 2017. 2016 Whale Entanglements off the West Coast of the United States. Fact Sheet. Pouey-Santalou, V., Kaulfuss, A., de Weerdt, J., Garcia Chavez, A.J., Smultea, M., Audley, K. Preliminary evidence suggesting habitat partitioning among bottlenose, pantropical spotted and rough-toothed dolphins off undescribed Guerrero,southwestern Mexico: winters 2014-2015. Presented at Society for Marine Mammalogy Conference, San Francisco, California, December 2015. 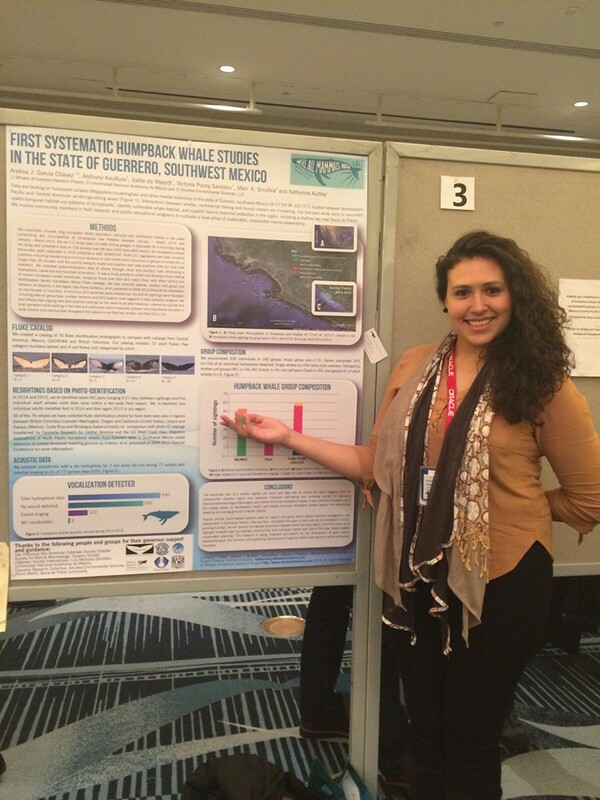 Andrea Jacqueline Garcia Chavez presenting our early work at the Society for Marine Mammalogy Conference in 2015.